Figure 1:1: The area of interest prior any FIB milling. Figure 2:2: Tungsten layer deposited on the area of interest. Figure 4:3B: Top-down view of the rough cut. 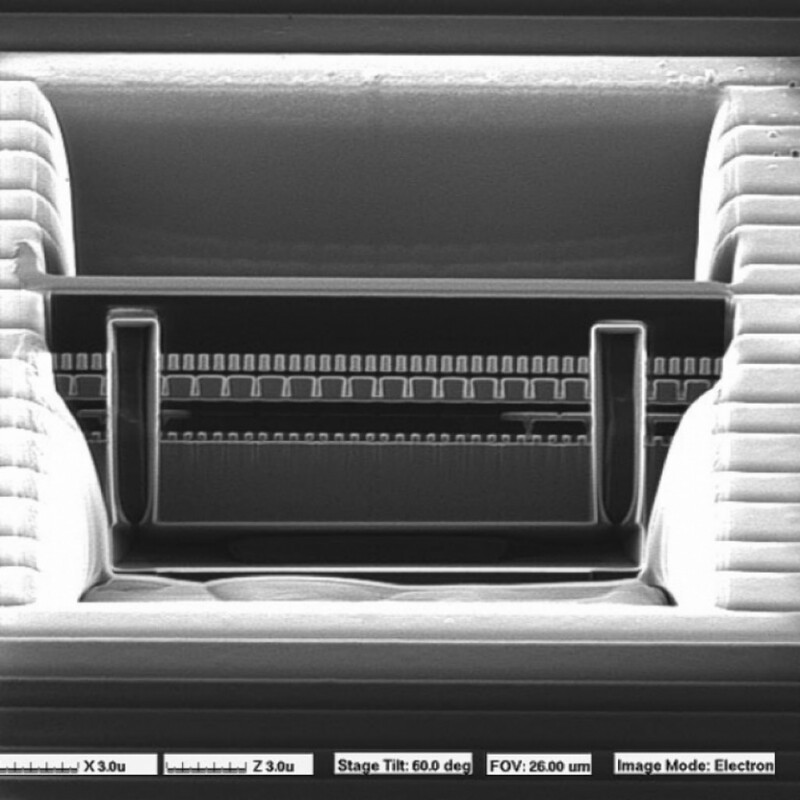 Figure 5:4A: Iso-view of the first polish. Figure 6:4B: Top-down view of the first polishing step. Figure 7:4C: Iso-view of the second polishing. Figure 8:5A: Top down view of the frame-cuts. Figure 9:5B: 45° view of the frame-cut. Figure 10:5C: Iso-view of the frame-cut. Figure 11:6A: Top-down view of the final polishing step. 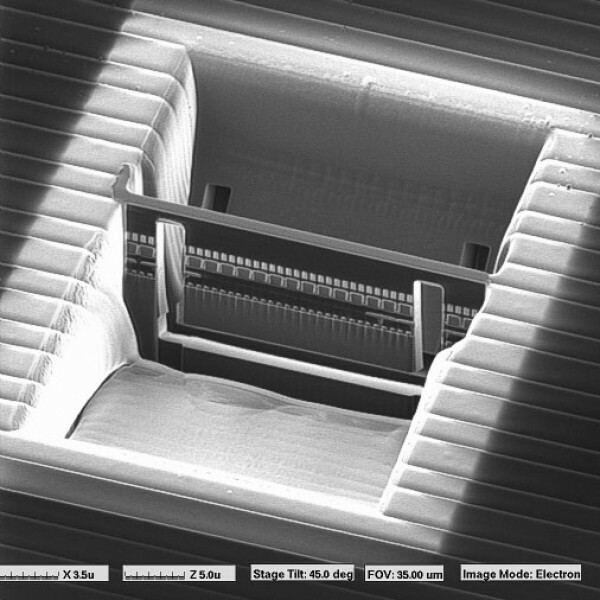 Figure 12:6B: Iso-view of the final polishing step. Figure 13:7A: Top-down view right before freeing the membrane off the trench. 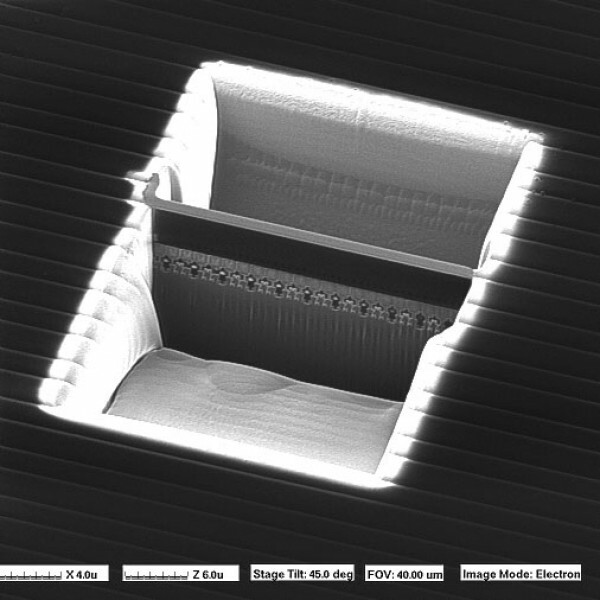 The "lift-out" technique has numerous qualities that make it attractive to industry when requiring TEM analysis. The total fabrication time for a site specific TEM specimen by this method is on the order of hours. For traditional FIB TEM specimens, the time is much longer. Of course the speed of fabrication is strongly dependent on material composition, and the geometry of the bulk sample. 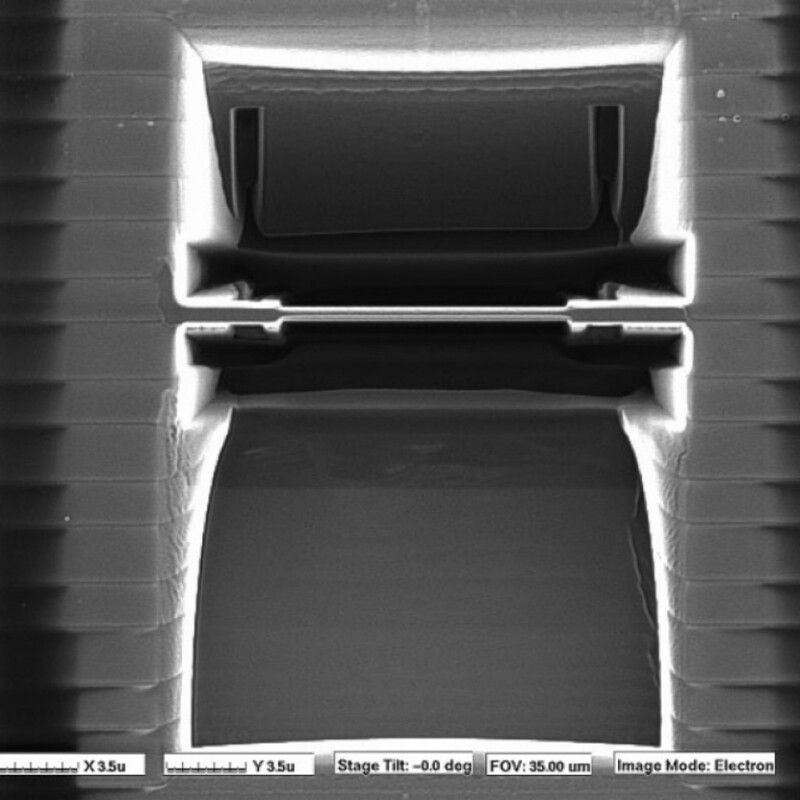 However, due to the fact that large amounts of ion milling time are eliminated using the "lift-out" method, it will always be a more rapid means of getting a TEM specimen from a bulk substrate. 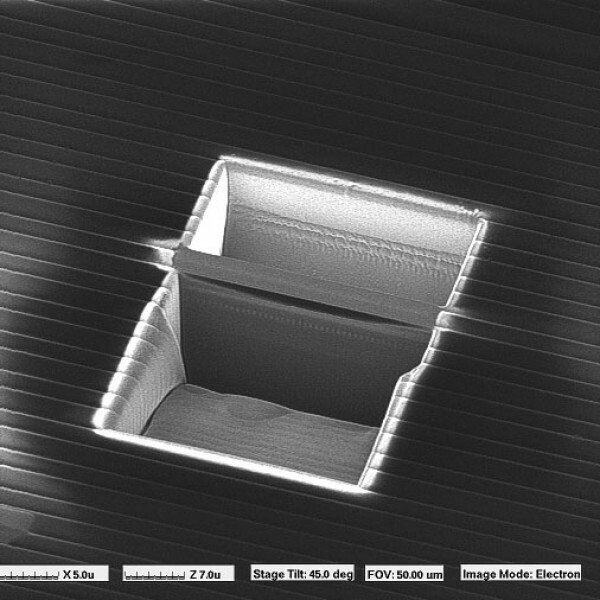 The final size of the electron transparent cross-section varies, but it can be as large as 150 square microns, to as small as 45 square microns. It also means that a TEM specimen can be manufactured from a specific area while leaving the rest of the die intact. 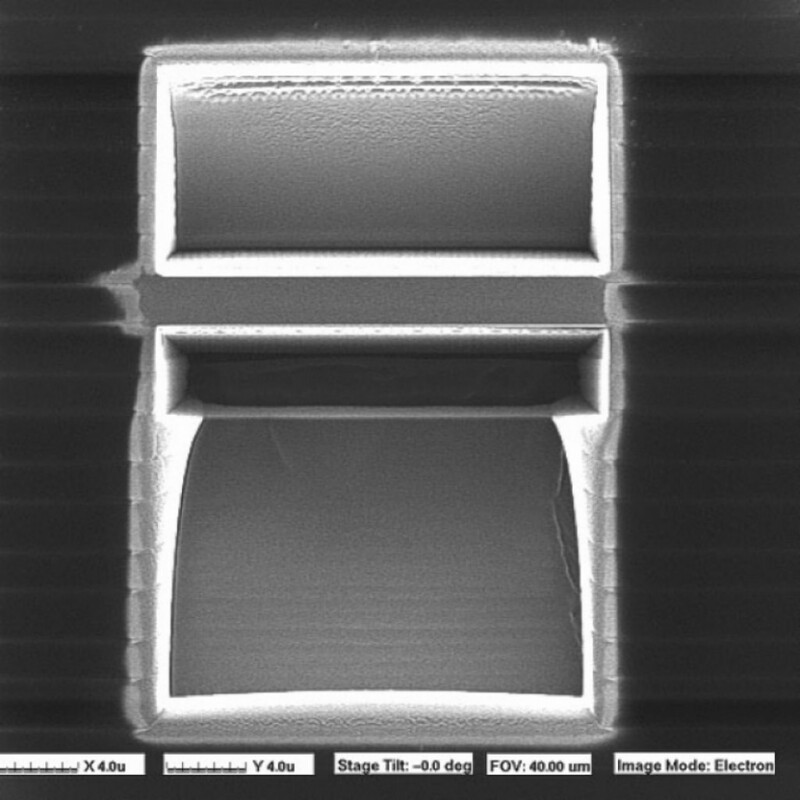 This may be an advantage to materials science clients who wish to look at specific areas of their substrate in a TEM without damaging their entire sample. If you would like more information about the "lift-out" technique and its application to the materials science industry, please do not hesitate to contact us. The location of an area of interest can be found using the FIB microscope's imaging capabilities. Imaging the sample allows the area of interest to be selected visually. 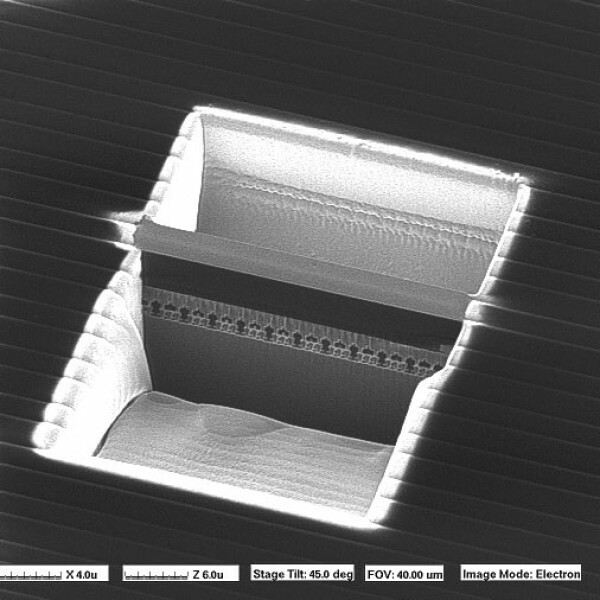 For semiconductor devices, the FIB system's precision navigation capabilities can be employed to locate the region of interest with an accuracy that is on the order of microns. 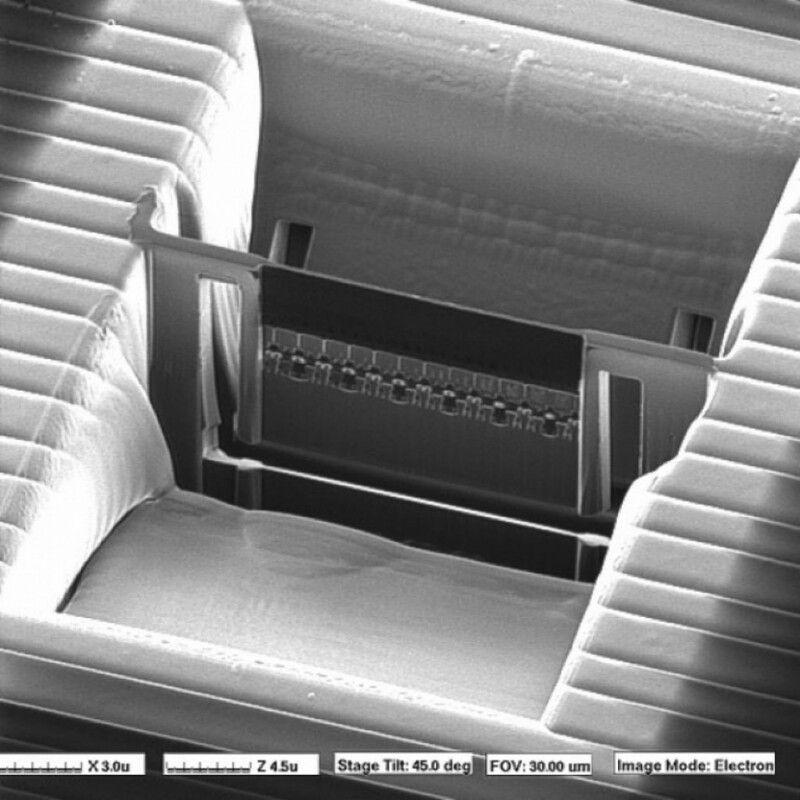 The image shows part of a memory array structure of an integrated circuit from which a TEM "lift-out" specimen will be prepared. A layer of FIB-deposited tungsten is placed over the area of interest to prevent milling, or multiple image scans, from damaging the surface of the TEM specimen cross-section. This step is especially important when surface phenomena on bulk samples are to be analyzed. FIB-deposited tungsten provides a fast and precise method for protecting surfaces during FIB procedures. 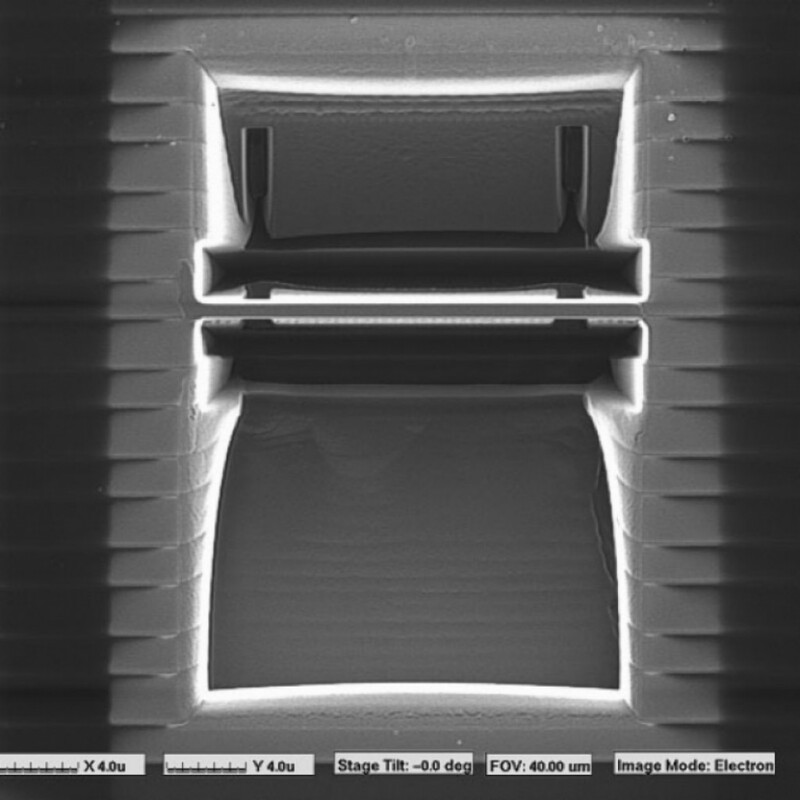 Using a large beam current for fast ion milling, two trenches are milled on either side of the tungsten that has been deposited above the area of interest. The trenches here have been milled so as to just touch the tungsten on either side, leaving a wall of material in the centre that is typically two microns thick. The trenches themselves are approximately twenty microns wide, fourteen microns long and ten to fifteen microns deep. 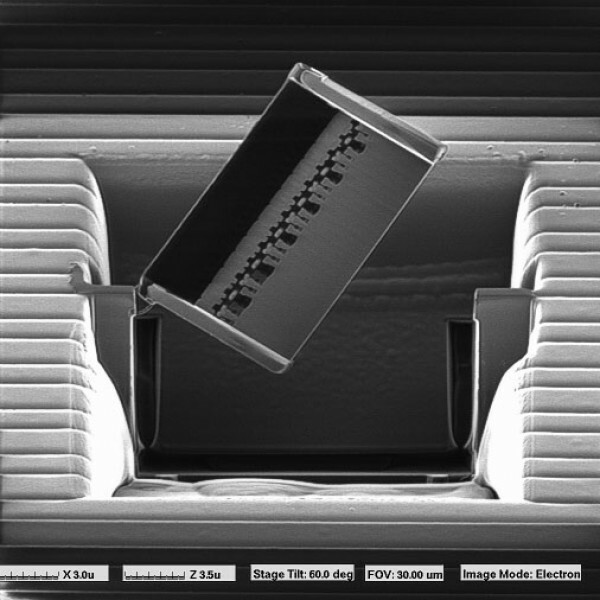 A smaller beam current is used to further thin the central membrane between the two trenches to a thickness of approximately 1 micrometer. Because milling at a sharp angle, or on an edge, enhances the speed and depth of the mill, the trenches are now stepped, with their deepest points being on either side of the central membrane. One micron is the nominal thickness at which it is recommended to proceed to the next step in the specimen preparation. The bulk sample and the area of interest are tilted to a steep angle, commonly 45 or 60 degrees. Three cuts are made to the central membrane, framing the area of interest. Inside these cuts, the membrane will be ion polished until it is electron transparent. Typically, the membrane is left attached to the bulk at its top two corners. This provides structural strength and stability to the membrane. Some damage is done to the membrane by tilting and imaging its face. 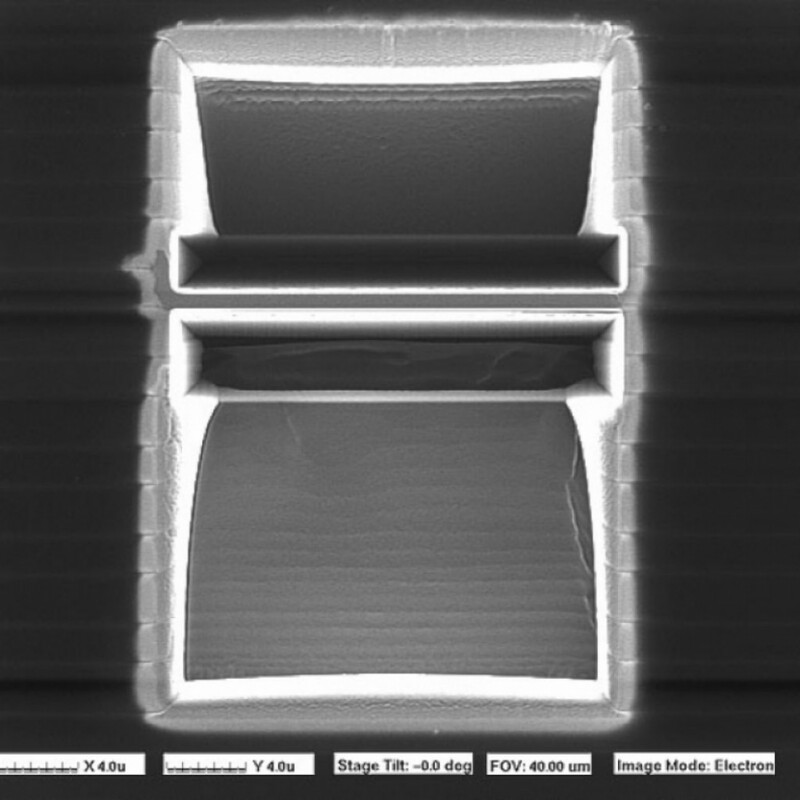 However, since the penetration depth is on the order of nanometers for any given material, any damage done to the cross-section is essentially restricted to the surface of the sample. During the course of the next few steps in the procedure, more than the first two hundred nanometers of material are polished away, ensuring that any damage to the electron transparent membrane as a result of imaging is not present in the final specimen. 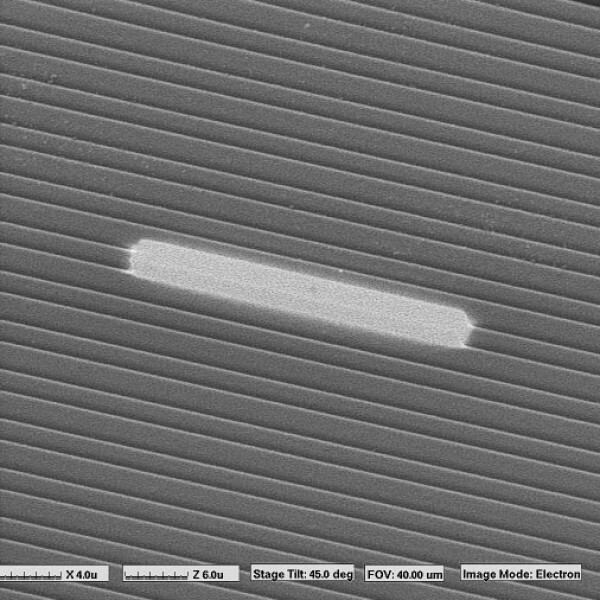 The beam current is reduced again, and the membrane is ion polished on both sides to a nominal thickness of approximately 0.3 micrometers. At this point, the membrane is very close to being finished. The minimal beam current associated with this step in the procedure leaves the membrane with almost no trace of the ion polish. 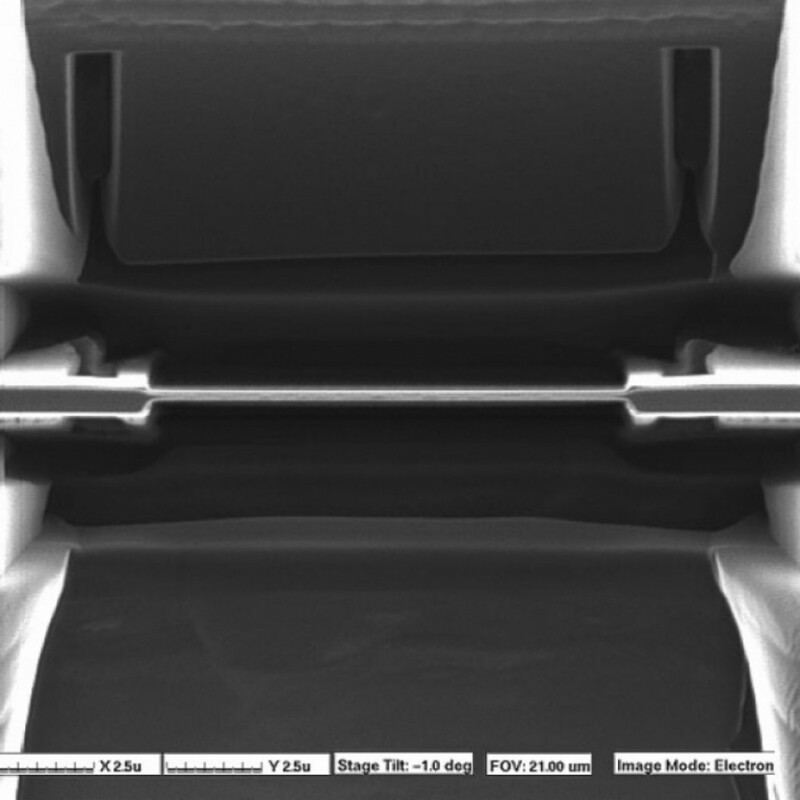 However, for most materials, 300 nanometers is still much too thick to be electron transparent. So the membrane still requires another very careful, very gentle polishing step. The last polishing step, again with reduced beam current, brings the membrane to a thickness of between 50 and 120 nanometers. At these thicknesses, the membrane is electron transparent, and will clearly display the cross-section of the area of interest in a TEM. 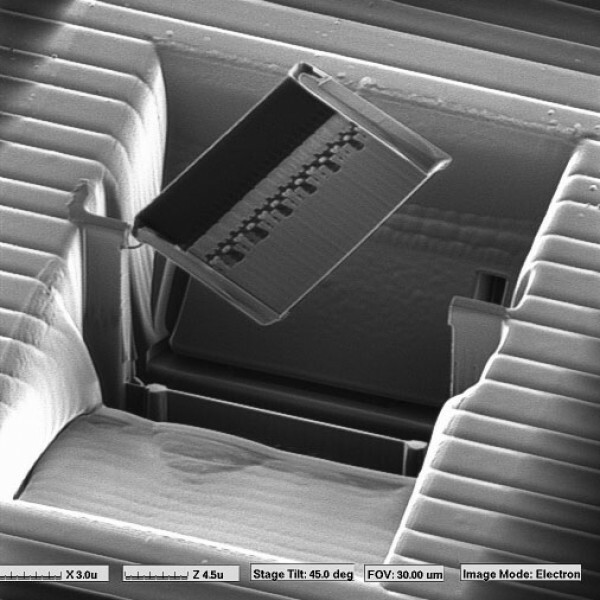 Milling on this nanometer scale demonstrates the precision that FIB microscope-micromachining systems are capable of attaining. This site specificity and precision make FIB systems very useful tools for TEM specimen preparation and any other milling on a microscopic scale. This step involves milling away the attachment bonds on the top two corners of the membrane that were left by the frame cuts. Once these two attachments are gone, the membrane is free from the bulk substrate. The TEM specimen often behaves in interesting ways at this point. 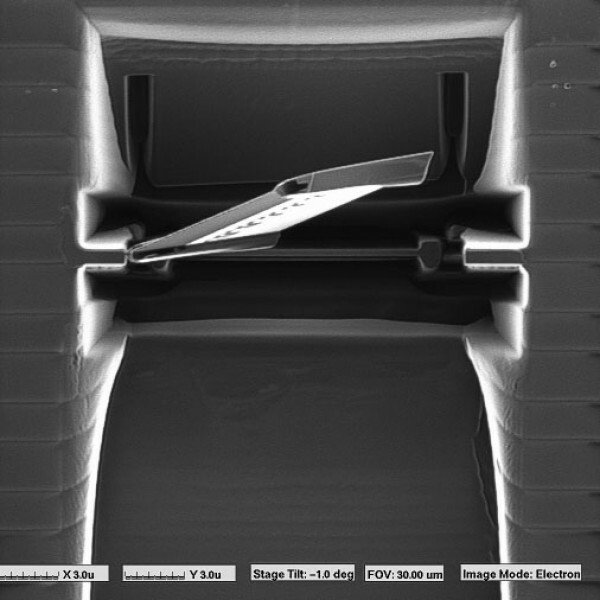 Shown in the images on this page is the TEM specimen tilting up and rising out of the trenches. This is a typical phenomenon, which happens with specimens from all kinds of different materials. It is generally held that the membrane itself, due to all the polishing with the positively charged ion beam, gains an electrostatic charge under the influence of the FIB. This charge is believed to be the cause of the membrane rising out of the trench and is also responsible for the membrane sticking to the probing, glass needle. Another point of interest that is visible in the images on this page is that the membrane is actually still attached to the substrate on its left hand side. This small attachment could not be cut by the FIB without imaging the face of the specimen, which would do damage to the membrane. This small strand of material does not pose a problem during the "lift-out" portion of the specimen preparation technique. The actual "lift-out" procedure involves the use of a glass needle and a micromanipulator, which is capable of moving the extremely narrow tip of the glass needle through exceptionally fine motions with a great deal of control. 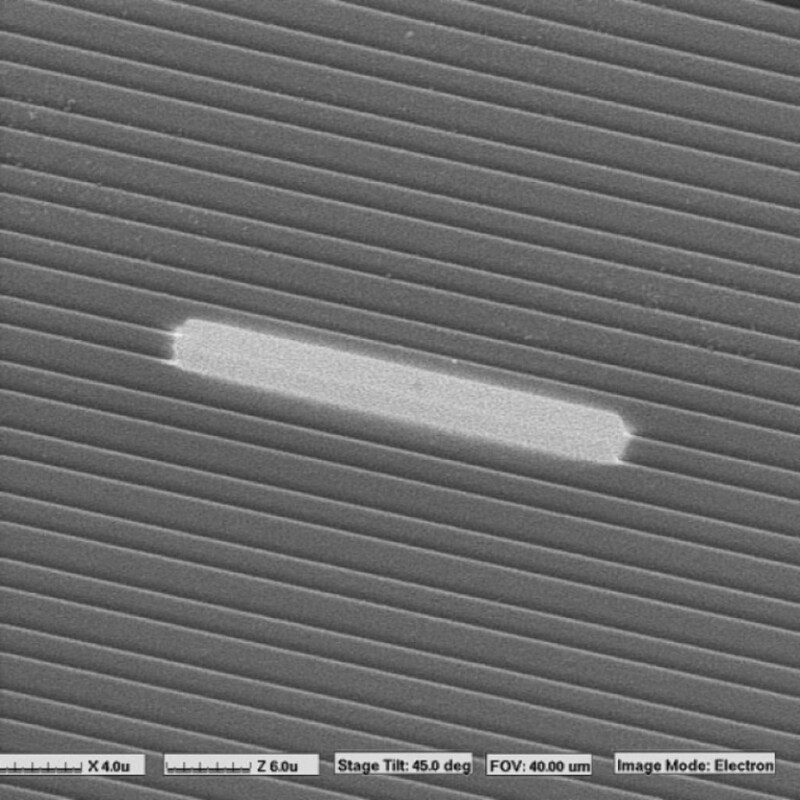 With the use of these items and a quality optical microscope, these FIB-machined electron transparent membranes can go through the final step before they are ready to be imaged in the TEM. 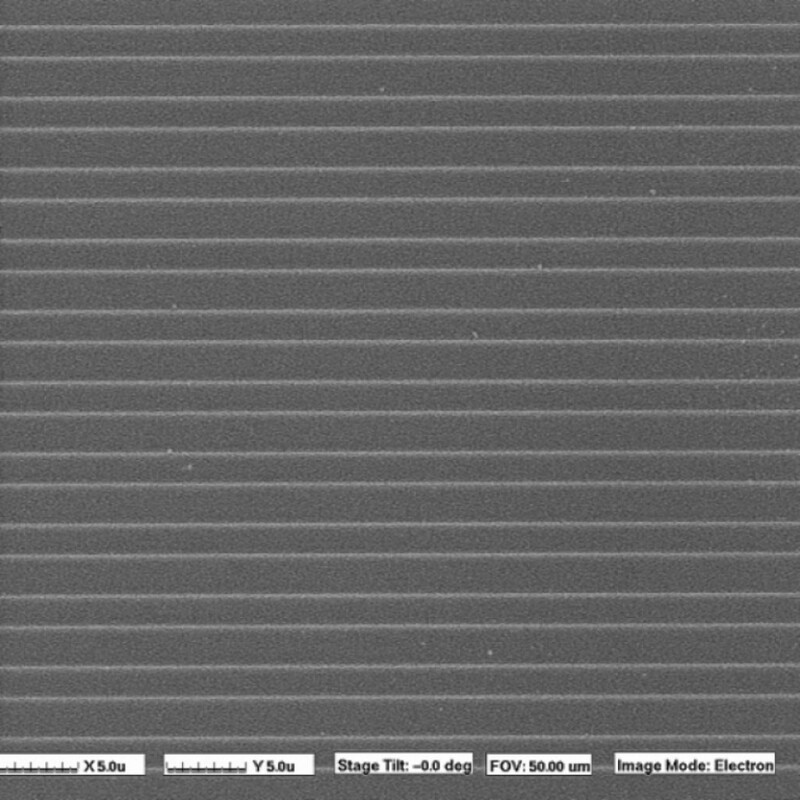 The TEM specimens are attracted to the glass needle and adhere to it when they come into contact with it. The needle can then be moved over to a TEM grid, typically made from copper mesh with a thin film of support material coating it, and the specimen can be transferred to the supporting film. 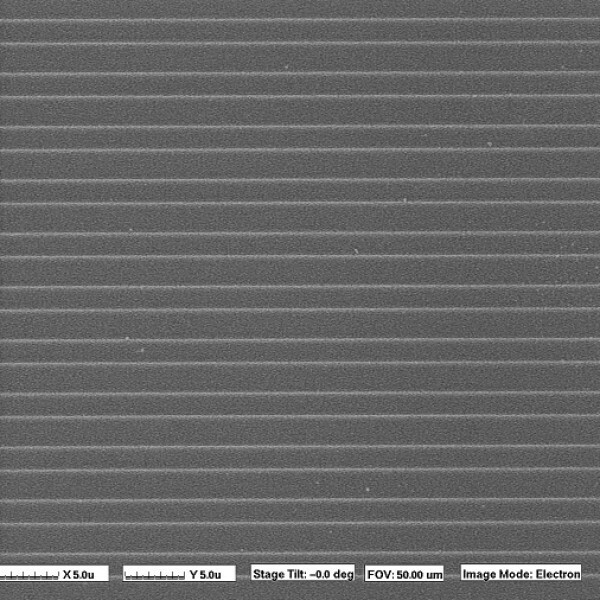 This grid can be put into a TEM and the specimen imaged in much the same way that any other TEM specimen would be.